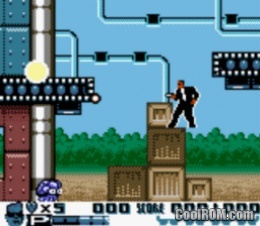 Despite benefitting graphically from the upgrade to Game Boy Color hardware, everything else about Men in Black: The Series was utterly forgettable: The game and level design was boring; the play time was short as well as unchallenging and the controls were simple but at the same time weirdly convoluted. The weirdly titled Men in Black 2: The Series (why not Men in Black: The Series 2?) arrived not even a year after the first game and in most cases, a sequel coming in such a quick turn around would be a bad sign, especially in the case of a licensed product. Surprisingly with this game however, it fixes every problem with the first game save overall length and is the best MIB handheld game ever produced. As was the case in the first Men in Black: The Series game (and as you’ll see in the next one as well…) there’s no threaded narrative through Men in Black 2: The Series as well. You enter a level, you’re told to collect four parts of a pair of sunglasses, represented strangely by a pair of sunglasses, and then locate an exit. 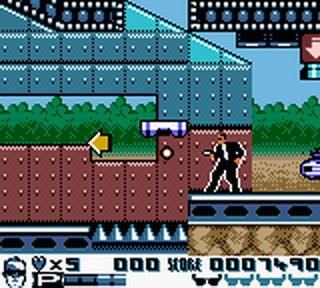 It’s not really a deal breaker that neither this, nor any other MIB handheld game based on the cartoon, have a story, but as the same time I think about games like The Adventures of Batman and Robin on the SNES as well as Konami’s Tiny Toon games that embraced the episodic nature of the source material for each level. I haven’t watched an episode of Men in Black: The Series since probably the late 90’s, but I recall the show having a few recurring villains so something as simple as “this alien is doing something bad at this location” would have sufficed for these games. It’s more forgivable with Men in Black 2: The Series though as unlike the first game, it’s fun to play. The best way to describe Men in Black 2: The Series, and stick with me here because it isn’t an insult, is that it’s like the rare times when LJN got it right in the 8-bit era, like in their Wolverine game for example. This isn’t a game that you’ll want to run out and tell your friends to try, but at the same time it’s an enjoyable way to kill an afternoon if you can get it for cheap. The most obvious way in which this game improves over its predecessor is in its visuals. 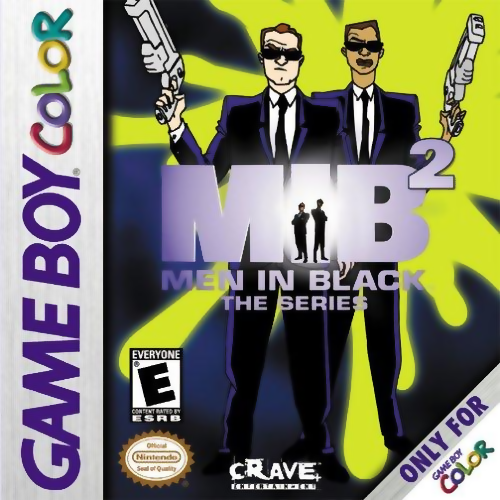 Men in Black: The Series wasn’t exactly an ugly game mind you, but it wasn’t optimized for the Game Boy Color either. Chapter two is a dedicated cart and it really shows from the environments. MIB2 has a lot of video game trope levels like a forest ice world, cities, etc. but there’s far more variety than part one. About the only thing that’s off, and I have to put this delicately, is the color of the playable character’s skin. In the first game you were Agent J only, but in this one you can play as either Agent J or K though neither have a unique advantage over the other. A somewhat noticeably problem is that Agent K looks a little….dark? To the point where when I selected him to see if he was different, I thought I was still Agent J and only realized that I was playing as K by an icon in the bottom of the screen. Men in Black: The Series was a bare bones, slow-paced, side-scrolling action game and its sequel is more a traditional action plat-former which is a welcome change. It’s awkward that the developer chose to switch jump and shoot, making jump B while shoot A, but after a quick adjustment you get used to it. Movement and jump momentum also feels much more akin to what you would expect from a game like this, meaning no awkward jump cycle and Street Fighter combo inputs to shoot upward; You simply hold up and shoot and your agent does it this time around. Power-ups also play more into the game and add just enough variety to an otherwise simple 2-D side-scroller. You’ll need an item for example to turn yourself invisible to shield yourself from cameras in one stage while in another you’ll need another to protect yourself from lakes of acid. Weapon variety is also a lot more varied than your basic gun and Noisy Cricket, even assisting in getting around the levels in certain cases. The rocket launcher will be needed to break down specific walls to get key cards and a late game freeze gun is required to turn regular stage enemies into platforms to reach inaccessible areas. Whereas the goal in Men in Black: The Series was make it to the right from the starting left point, you have to collect four pairs of glasses in order to clear a stage in the sequel as mentioned above. MIB2 strikes a good balance between offering just enough rewards off the beaten path while at the same time being linear enough such that you won’t ever lose your way. Levels are far more vertical, in that you actually have to go off the ground to get a collectible, with some stages even oriented completely upwards with some tricky obstacles in the way such as screen filling laser beams. There’s a decent amount of challenge, though some of it can seem unfair at times. Why I brought up Wolverine earlier is that there are elements of this that remind me specifically of that game. The way damage works for example, in that an enemy can get stuck around you and eat away your health because there’s no damage buffer and in the snow level there are platforms that fall out from under you with very little time to reach like the fire stage in Wolverine. Your agent also takes damage if they fall from a certain height, but you never die from this and the damage you take is normally not that bad. Not every stage in Men in Black 2: The Series culminates in a boss, disappointingly the last one doesn’t, but when they do they’re normally fun to fight. Far more than the minor announces that populated Men in Black: The Series, here you’ll have to carefully watch enemy patterns and search for weak points. One of the standouts is a giant UFO where you have to strategically shoot off different parts while avoiding bullets coming from both multiple cannons. Some however are frustrating in that you won’t really know what to do which is the case for a fight where little enemies are coming down from multiple pipes. Instinctively you would think to destroy the machines producing the creatures, but you’re actually meant to simply kill them as they come down. Bosses tend to have damage meters to reflect that what you’re doing is working, but in that fight, there’s no such indicator but this is also just one instance as well. An improvement in every way from the first game, Men in Black 2: The Series is fun, throwaway 2-D action side-scroller that can be a fun afternoon diversion if you can buy it cheaply. It may not reach the highs of the 8-bit licensed games made by Konami and Capcom from the NES days, but at the same time it does feel enough like an NES game that those who grew up with those types of games might appreciate it if you come at it with an open mind. It looks nice, controls decently, and offers enough variety to keep it from getting stale over the course of its short eight-stage campaign to make it a play it once and forget it kind of game. Easily the best Men in Black portable game and an above average game on a system with a lot of mediocre licensed games.